‘Tis the season to eat, drink, and be merry…and do a little holiday shopping. ‘Tis the season to eat, drink, and be merry…and do a little holiday shopping. While the holidays can be a little daunting from making sure everyone on your list is taken care of, the perk of this year's early Thanksgiving is an extra week to enjoy the holiday spirit. 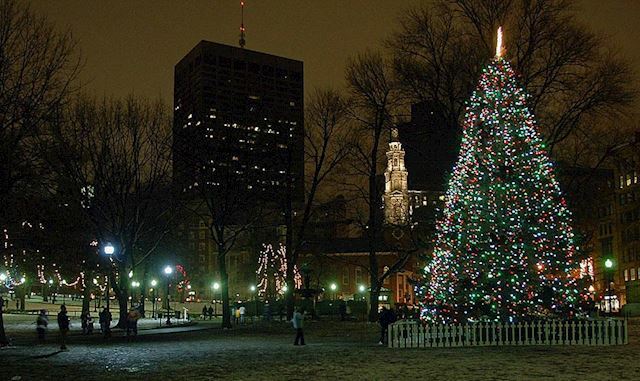 Boston's annual Boston Common holiday tree lighting takes place this Thursday, giving you the chance to join in the festive fun around one of the country's oldest ice rinks! Head to Boston Common (easily accessed via the MBTA at the Park Street Red and Green line station) for an early evening of cheer. A free skating show kicks off on Frog Pond at 5pm from the Skating Club of Boston and feature internationally renowned skaters as well as a performance by Theatre on Ice of Boston. After the ice show, Boston Mayor Martin Walsh will lead the 77th annual lighting of the Boston Common Holiday Tree, a tree donated each year by the people of Nova Scotia as a note of thanks for Bostonians helping with relief efforts for a ship that exploded in Halifax Harbor in 1917. A live broadcast of the lighting of the 46-foot white spruce will take place on Boston's Channel 5 a feature performances by Andy Grammer and other recording artists.